There are a few things anyone would expect in a zombie game… zombies, gore, a few scares, some cannibals, and a charismatic main character… otherwise, why bother. What you don’t expect is character development, sacrifice, and genuine emotion… and Telltale Games’ The Walking Dead delivers on all of the above. I originally reviewed the first episode and was completely impressed with how this game differed from any other I had played, both visually and emotionally. Visually, it had the look of a motion comic and retained much of the design of the source material… it was both familiar and odd at the same time. Emotionally, the game played around with your feeling for the main character, Lee, who was originally shrouded in some mystery regarding his back story, and his young ward, Clementine, a young girl Lee finds after his first escape from the law and the undead. Throughout that first episode we crossed paths with a couple of people from the comics before heading into completely unknown territory. In the second episode, we left the confines of the known into a story with little (Lilly Caul from the comic and the second TWD novel is a character) or no ties to the comic or the TV show and it was here that the game truly took off. Although the mechanics of the game, having to make split second decisions based on a tree with three or four responses, remained essentially the same, there were a few tweaks as the game progressed. I noticed that some of the decisions gave you a bit more time while others felt even faster. A lovely nod to the timeliness of certain problems over others. Originally the game was meant to come out one episode every month for five months… instead, the timeline was more along the lines of one episode every two months… which made for some frustrations as well as a couple of welcome surprises. Frustrating because you want more of the story… rewarding because I would occasionally forget all about the game until I would hear the announcement that the latest episode would be released. Unfortunately, I don’t always retain everything that had happened and would rely on my kids or friends to remind me of what the happened thus far. Lucky for me each episode begins with a “previously on The Walking Dead” segment bringing you up to speed. So we begin the game with one character, Lee, and progress to adding a number of people to your group. As the story winnows down, we lose members of our group and we gain some… the lose some more. Some of the deaths are obvious, others are heart wrenching and unexpected. Just when you think you have an idea as to what is going on, a curve ball gets thrown and suddenly you find yourself staring at the screen in disbelief, and yes… true sadness. Be forewarned, this is not a happy game. There is grief and misery around every corner and the horrors don’t stop with the zombies… like all the best zombie stories, and The Walking Dead in particular, it is the living that causes more problems than the undead, and this game does not shy away from that fact… nor does it shy away from some gruesome decisions and scenes, that although not realistic in it’s gore, it definitely has a number of squirm inducing moments. Please note that I am doing my best not to discuss any of the plot points in this story… that is the fun of this game, watching and interacting in this unfolding tale of zombie survival. I was able to accurately predict a couple of things, more so in the first few episodes, but by the final two episodes, I was in the dark and eagerly anticipating answers to the mysteries this game lays out for you. Also, a few of the clunkier parts of the gameplay became more smoothed over… or, I simply got used to how this game was played. Either way, it was much more enjoyable as the game progressed. Another element to the game that I noticed was that every episode seemed to run between two to three hours in length. I played the first four episodes in two sittings… the fifth and final episode found me playing through in one push. I’m not sure if that says more about the story or more about my desire for resolution and completion… whatever the reason, I was fully vested in these characters by the end… and was deeply saddened by the inevitable conclusion. I would like to bring up one minor complaint… I was hoping that this whole “choose your own adventure” structure the game took would give us truly different outcomes… but that seems to work in a matter of degrees. The outcome seems to be the same regardless of your decisions. I am aware of how a few things would play out if I had made different decisions, but overall, it didn’t seem to impact the main arc much at all… which is a shame. I was hoping for greater ramifications for your decisions than what ended up being the case. 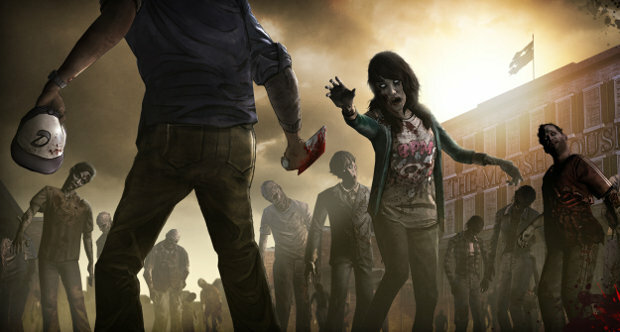 Good news for us though… Telltale is working on a second season of The Walking Dead. I look forward to the next installment… whether it involves characters we know from this season or not, I’m on-board. There is already some talk about The Walking Dead being the Game of the Year… I’m not sure about that, but I wouldn’t be surprised. A huge emotional payout with a relatively small amount of time… and immense replay potential. I can’t wait to play through the game in it’s entirety, making a number of different decisions… and helping out others more than I did the first time through, in addition to not lending aid to others. Would I recommend Telltale’s The Walking Dead? Absolutely. A fantastic game with a low price and a great emotional wallop. If zombies are your “thing” than this game is something you can’t pass up.